Pensacola's Tyler Mahle stared down Caleb Adams as the Mobile left fielder stood in the batter's box, knowing Adams was the only man standing between him and perfection. Adams took a swipe at a 2-2 fastball and sent it back toward the mound. Mahle had little time to get his glove on it and even less to think about what would come next. "It happened so quick. I just threw the ball as hard as I can over the plate and I got the ball so quick in my glove," Mahle, the Reds' No. 10 prospect said. "I looked up and [first baseman Eric Jagielo] was standing there with his wide eyes and that was it." Mahle jogged the ball toward first, flipped it to Jagielo for the final out and completed the first perfect game in Blue Wahoos' history. 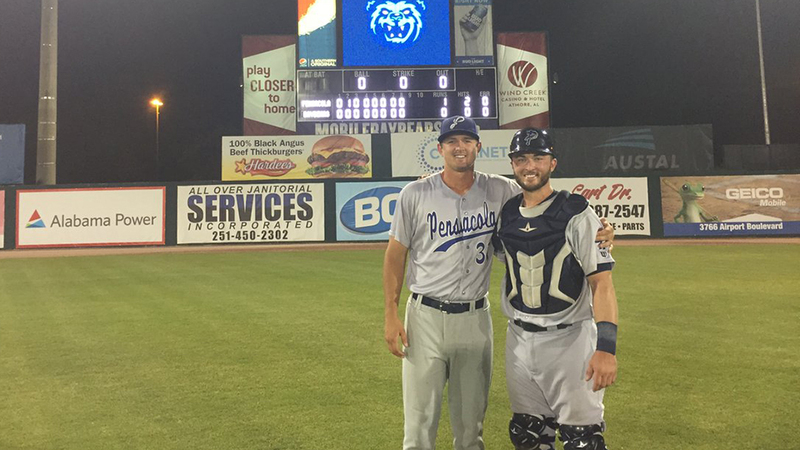 The right-hander struck out eight as Double-A Pensacola edged the BayBears, 1-0, at Hank Aaron Stadium. It was the second nine-inning perfect game in Southern League history and first since Montgomery's Charles Swanson shut down Savannah on Aug. 14, 1970. "I feel perfect," Mahle said. The 22-year-old only got into a three-ball count once, rebounding to strike out catcher Francisco Arcia to start the second inning. By definition, there shouldn't be anything wrong to find in a perfect game, but Mahle still saw room for improvement. "My stuff wasn't technically perfect tonight" he said. "My slider, I threw a lot of those up some of them backed up, I threw my changeup well, I want to have a curveball. … I mean, I have one, but I don't throw it very often, so I mean there was a lot of stuff to work on. "It could have been better. I'm not getting greedy, but you could always get better." Mahle made a bid for a perfect game on April 12, allowing one hit over seven scoreless innings at Biloxi. On Saturday, he credited most of his success to fastball command and the little bit of luck that was missing a year ago. The California native tossed a no-hitter on June 13, but was one baserunner away from a perfect game while pitching for Class A Advanced Daytona. The one blemish on his ledger that night came on a controversial hit batter in the third inning, which Mahle still had on his mind. "The other one, the only problem was the hit batter, which was kind of weird because everyone thought it was a foul ball -- and it was," Mahle said. "I was just that close, you know, just one out away. Tonight could have been the same way. There was some hard-hit balls, but my defense behind me was right where they needed to be and they were running balls down." Mahle's offensive support was limited to a run on two hits and a walk in the second as the Blue Wahoos were unable to put a runner on base in the other eight innings. Mobile starter Tyler Carpenter worked in lock-step with Mahle from the third through the eighth, striking out six. "I saw that their starter was doing good, so I said it earlier in the game, just to myself, I was like, 'Hey, here we go,'" Mahle said. "After we put up that run, I just got to focus on my stuff and I figured we would score more because we've been hitting the ball real well, but all I could do was go out there and do my thing and not worry about what he's doing." Mahle made it through the outing on 88 pitches -- matching a season high, although that other outing was a five-inning stint -- and threw only 13 in the final frame. "I knew I felt good, even if the pitch count was high," the 2013 seventh-round pick said. "I was still perfect, so I knew they weren't going to take me out or anything, but I wasn't worried about anything but making pitches." After putting his name in the Southern League record book, Mahle knew who he wanted at the top of his list for a celebration. "Definitely my catcher, Joe Hudson. He was calling the game and he called a great game and me and him were working together," Mahle said. "I mean, I wanted to hug all my teammates. But when you're in a battle like that and one mistake can cost you, that's the guy you've been working with for nine innings, so that's usually the guy you want to go to." As fate would have it, Hudson produced the game's only run with an RBI single.